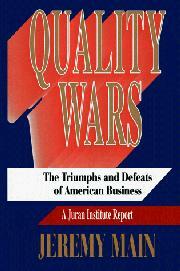  A journalist's objective and informative report on total quality management (TQM) in the US over the past 15 years. Drawing on the resources of the Juran Institute (a Connecticut-based consultancy that underwrote his research), Main provides a wide-ranging, jargon-free briefing on TQM's past, present, and potential. At the outset, he assesses the factors that induced American enterprise to add quality assurance to its operating manual during the 1970s. These range from the inroads made by Japanese suppliers in domestic markets to recurrent oil crises and the desire to gain or maintain a competitive edge. The former Fortune editor goes on to document the frequently ineffectual efforts of pioneering corporations to embrace TQM, an eye-of-the-beholder concept that requires top-down attention, employee involvement, customer orientation, and the use of tools (benchmarking, control charts, statistical measurements) that he fears are beyond the capacities of ill-educated US workers. Main next provides an anecdotal audit of companies that have made a success or failure of TQM. Among those singled out for accolades are Banc One, Ford Motor, Hewlett-Packard, Intel, Motorola, and Xerox. The ranks of the fumblers include Caterpillar, Florida Power, GM, IBM, and Southern Pacific (several of whom are past winners of the Malcolm Baldridge National Quality Award). Covered as well are services (airlines, finance, insurance, telecommunications), the professions (education, law, medicine), and government. Among other advantages, Main concludes, TQM can afford committed organizations a focus (i.e. clients, consumers, or the tax-paying public) they previously lacked, enhance labor's loyalty and competence (though Main worries about the impact of mass layoffs in the name of cost containment), put a premium on genuine leadership, and otherwise yield handsome returns. Accessible, down-to-earth guidance on a demanding oversight philosophy that, for all its recuperative powers, promises the commercially challenged neither quick fixes nor instant salvation.